Everyday Practices Along the Border	By Are You Syrious? During CWB -USA’s 2018 Balkan Tour, Jeroen (a person providing humanitarian aid to refugees in the region) proved to be an instrumental member of the team. Thanks to his consistent and ongoing work in the Balkan region, he has built deep trust with migrants traveling Refugee Road, through the Balkans. Jeroen helped CWB’s volunteer artists access communities that would otherwise have been too hidden, or hesitant, to welcome outsiders. 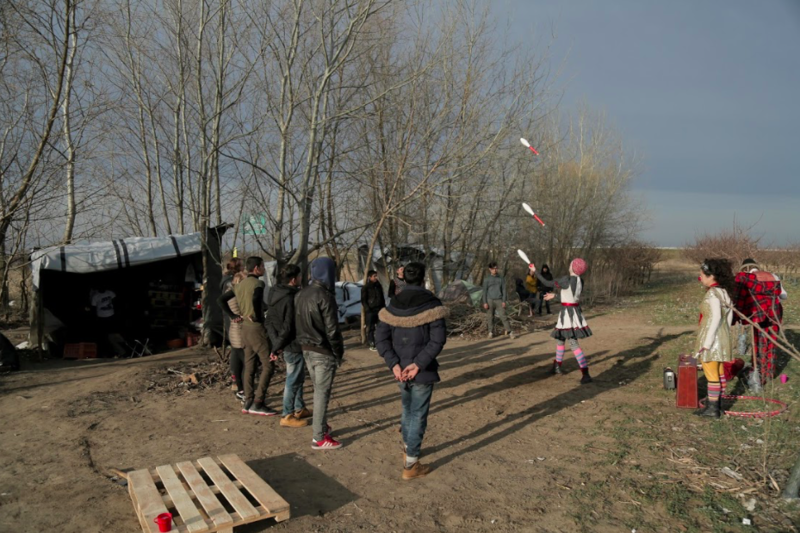 Because of him, CWB clowns were able to perform for men and boys who hide in the woods along the Balkan Route, treating their attempted border crossings as “the game,” and living in emotionally and physically uncertain and unstable conditions. Because of his unique perspective on the lives of Balkan migrants, Jeroen witnesses moments that CWB doesn’t normally document but which are all too frequent for people who attempt to cross political borders. CWB’s policy and framework is one of restorative justice, but the following statement provided by Are You Syrious?, an NGO supporting refugees in the region, provides valuable context to the crisis situation that the clowns entered into when they volunteered for this tour. Have we really banished little Madine’s family again? It has only been three months since the terrible death of a one-year-old girl named Madine—a death that has not yet been answered for—in Croatia. Her family is once again exposed to the cruel treatment of the Croatian state. On the night of March 8, a seventeen-year-old girl sent us a disturbing distress call. She informed us that her family, along with another refugee family, were located near the village of Strošinci. She said they were hungry, and they wanted to ask for asylum in Croatia. Out of a group totaling 19 people, 11 were children, including two babies. They begged us to contact the police on their behalf, and inform the police of their intention to request asylum in the Republic of Croatia. When we asked for their names, we realized it was Madine’s family. Once we knew their location, identity and condition, we notified the necessary police stations. Although Madine’s family was afraid of meeting with the police because of the possibility of renewed deportation, they realized it was the only way to request asylum in Croatia. They approached police officers on patrol and stated their request. According to the family’s statement, instead of answering the request to call medical assistance for the the children, they were searched and deported. Both families were forced to return to Serbia. Can we publicly ask ourselves what would happen if these families now experience another tragedy? If the Croatian police are doing everything under the law, as they claim in the interior ministry, how is possible that we have re-deported the family of little Madine? Why are the Croatian border police brought into a position in which they tell crying children and their mothers that they must turn around and walk back through the cold rain, out of our country? We’re seeking answers from the interior ministry and chief of border police, Zoran Ničena. We’re asking what happens to families who seek international protection in Croatia? We invite fellow journalists to investigate this case which is, unfortunately, the best illustration of everyday illegal practices on the Croatian border.